With summer in full swing now we thought it a good time to take a road trip to the cool Blue Ridge Mountains. Our destination is the historic Valley View Farm. Recently added to the peach orchards, apple orchards and black and blueberries, the Strother family has planted grape vines. These new vines are the first plantings for Virginia’s newest winery, Valley View Farm Winery. Valley View farm is considered one of the most spectacular landscapes in the northern Piedmont of Virginia. “We are thrilled to provide a complete destination experience for customers who appreciate locally produced products, who we refer to as, “Locavores”. To be able to make this site available to Locavores to enjoy fine wine, Virginia ciders, pick-your-own fruits, and organically grown vegetables is nothing short of being able to create the perfect local farm fresh experience,” Philip Carter Strother, owner of Philip Carter Winery. The farm is a 500-acre tract that is rich in history and, with one exception, has been in the same family for nearly three centuries. Located in the Crooked Run Valley in northern Fauquier county, the farm was patented in 1731 by James Ball of Lancaster County, a first cousin of Mary Washington, the mother of George Washington. Originally land of the Powhatan Indians, the Valley View tract was inherited in the early 18th century by Thomas, sixth Baron Fairfax. In the 1740’s it was first settled by several pioneer families that moved into the region, many of the original settlement structures built on the farm in the mid-1700’s remain today. In the mid-nineteenth century Quaker pastor Henry Simpers purchased the property. He offered it as a stopover point for the Underground Railroad. During the Civil War, Simpers allowed armies from both sides to camp at the farm, including Stonewall Jackson’s troops who marched through on their way to the battle of Second Manassas. Upon Simper’s death in the 1920’s, George Thomas Strother purchased the farm for his son Ed Strother who worked the property for sixty-one years, from 1926 to 1987. 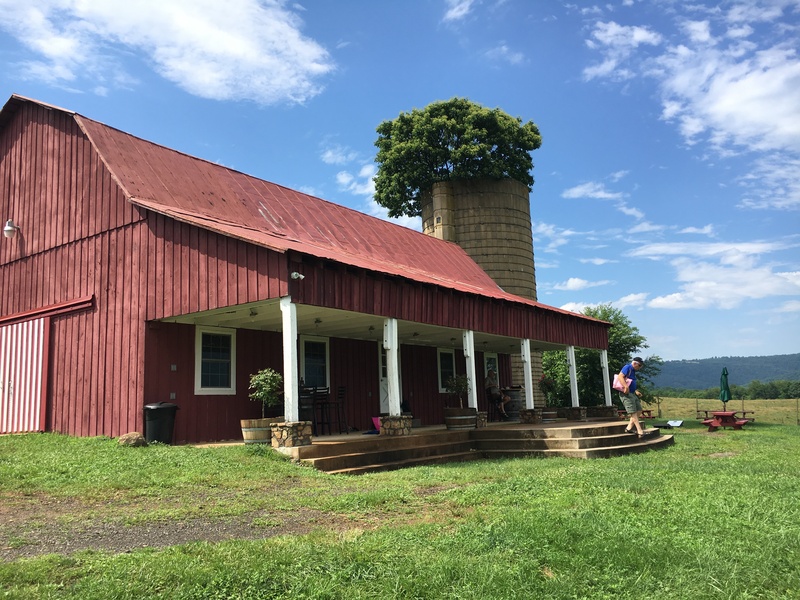 He bought and sold cattle, raised sheep and horses, and built a new manor house and red barn, which is the current location of the Locavore Farm Market and serves as the tasting room. (The photo on the cover of this issue was taken by Philip Strother from the porch on the front of the red barn.) Neighbor and famous general, George S. Patton, enjoyed foxhunting with Strother. In 1997 Charles E. Strother, Jr. inherited the farm he had been helping his father run for the previous decade. Charles expanded the farm business offering the farm as a retreat for day outings by business groups and religious groups. 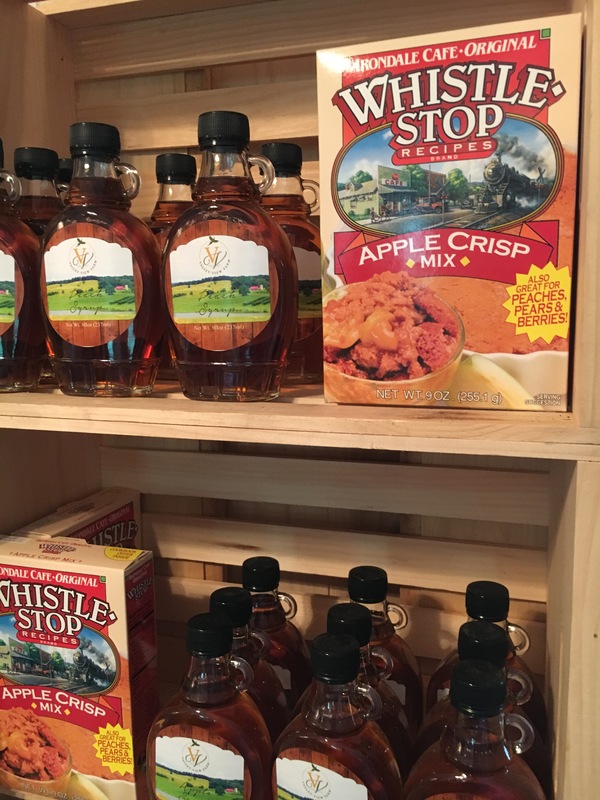 He also established a Pick-Your-Own attraction, formerly known as the Virginia Perfection Orchard, featuring both pick-your-own fruits and vegetables. In 2016, Charles and his son, Philip Carter Strother, formed Strother Family Vineyards that currently operates a vineyard on 45 acres of the farm. 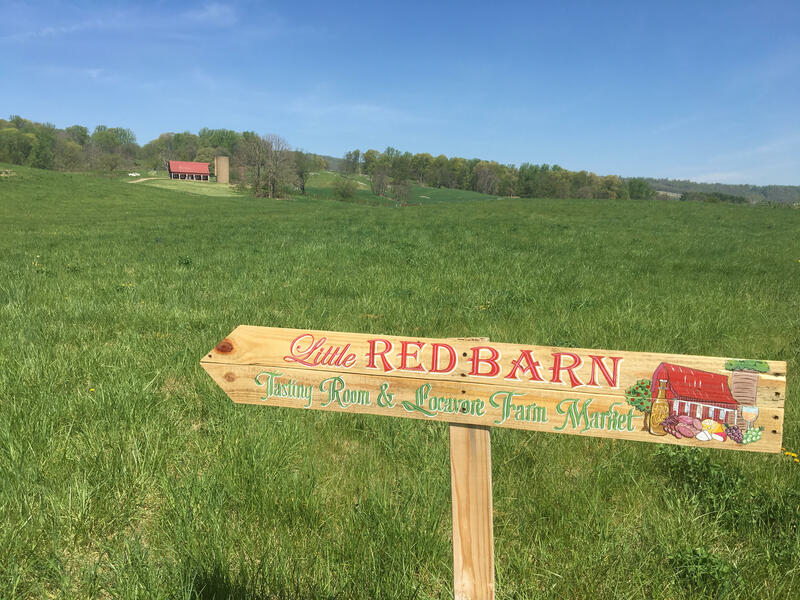 Father and son also collaborated once again to open the Locavore Farm Market & Tasting Room at Valley view Farm, in the red barn that Philip’s Grandfather built in the 1920’s. Unfortunately, Charles Strother passed away this passed June and he will be missed, but his Valley View Farm lives on. The farm is easy to get to by taking I-66 west to Route 17 to Leeds Manor Road. The farm is a half mile down the road. With five hundred acres there is plenty of room for everyone and is kid friendly. Although the blueberries have been all picked, the peaches are now beginning to ripen. This is definitely a destination for seasonal pick-your-own fruits and vegetables. If you want to get a true feeling for the farm, there is a herd of very friendly Angus cattle in a pasture behind the Red Barn. As I mentioned, the red barn is more than a tasting room. 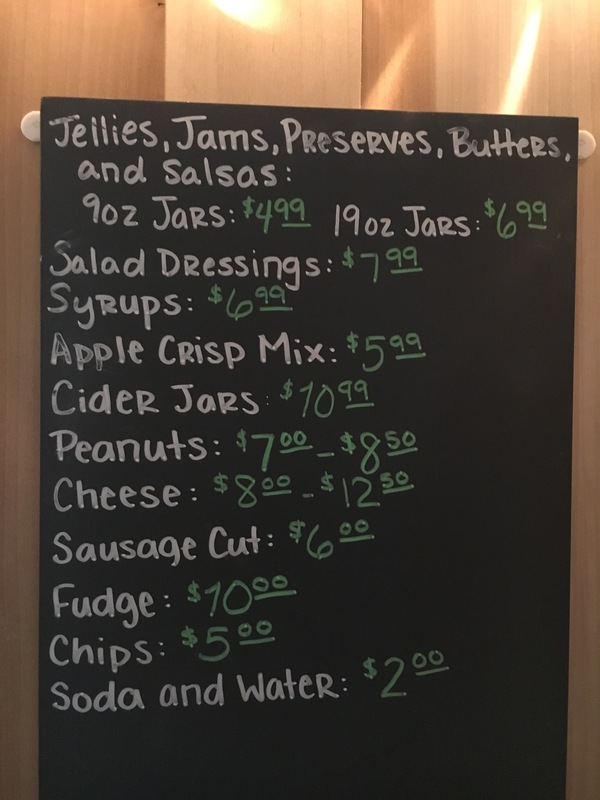 Here you will find local farm produce including eggs and homemade butters, syrups and salad dressing along with jams and jellies. Rounding out the market is the Orchard Branch Collection. These pieces are all created by local artisans and are made from repurposed barrels, farm products, wood, and equipment from the historic Valley View Farm and Philip Carter Winery. 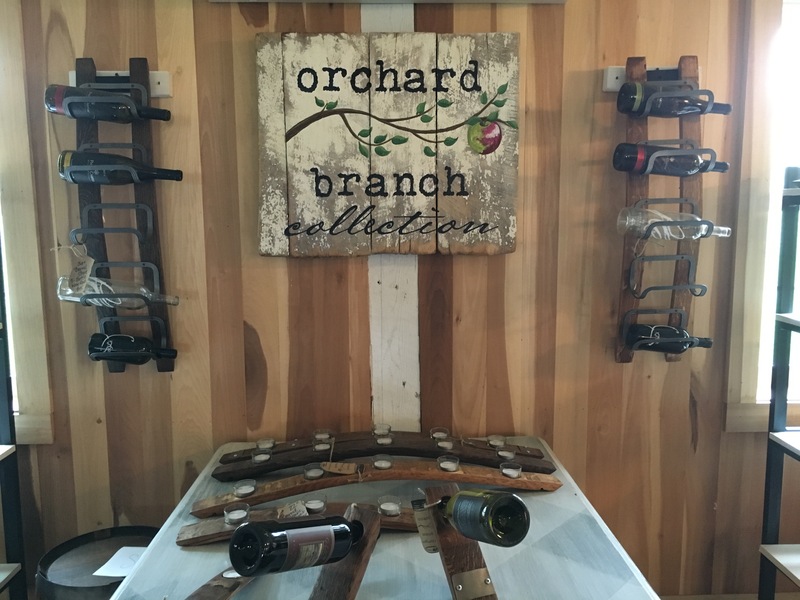 The Orchard Branch Collection is available exclusively at Valley View Farm and Philip Carter Winery. The temperature can be as much as 10 degrees cooler in this part of the DMV than in the city in August. It is a great time to take a drive to the mountains. Once here, you are also near some of Virginia’s other wonderful wineries. Ten miles down Leeds Manor Road you can find Naked Mountain Winery and Philip Carter Winery. Also, nearby are Three Fox Vineyards, Barrell Oak Winery, Aspen Dale Winery and Fox Meadow. Near Warrenton you can find Pearmund Cellars as well. Take a drive, kick back with a bottle or two of Virginia wine and enjoy the beautiful Blue Ridge Mountains.